Chanteur Rockabilly puis Country US né Martin Glenn Barber, le 2 Février 1935 à Hollis (Oklahoma). 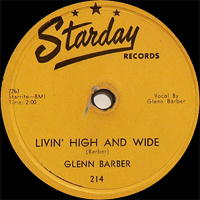 Glenn Barber déménagea ensuite à Pasedena (Texas) et c'est ainsi qu'il fut engagé par Starday Records en 1954. Il enregistra ensuite sur D, Hallmark, Skill, Hickory, Sims, Stampede, Pic et Groovy Records. Glenn Barber est décédé le 28 Mars 2008. 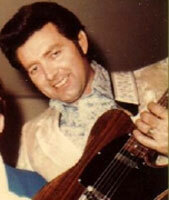 Country and rockabilly performer Glenn Barber was born in Hollis, OK, on February 2, 1935. From there, he and his family moved to Pasadena, TX, where the young Barber showed an early interest in music. Originally a guitar player, he also took up bass, drums, dobro, and mandolin. 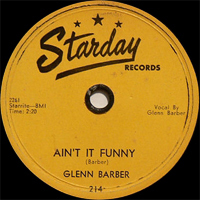 He first appeared on wax with the 1952 Stampede single "You Took the Twinkle Out of My Stars"; by 1954, he had a contract with the Starday label. 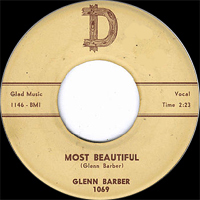 Over the next few years, Barber would release numerous countrified rockabilly singles on the label, the last being issued in 1956, just as rock & roll was sweeping the country. 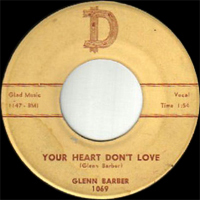 From there, he and manager Pappy Dailey traveled to the D imprint, which issued four Barber singles during the remainder of the 1950s. 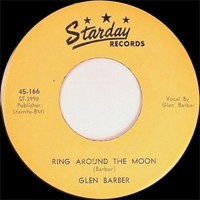 As the '60s arrived, Barber became a disc jockey and featured performer on Houston's KIKK. He and his band, the Western Swingmasters, appeared on the station five nights a week until 1968, when he signed with the Nashville outfit Hickory. There he made his full-length debut with 1970's A New Star. 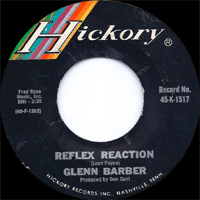 While with Hickory, Barber charted four times, taking songs like "Kissed By the Rain, Warmed By the Sun" (1969) and "Unexpected Goodbye" (1972) all the way to the Top 30. Another Hickory single, "She Cheats on Me," would later be recorded by Roy Orbison. Barber jumped to MMI in 1979, and penned the hit "Everyone Wants to Disco." It was his last charting single, and Barber turned to other interests in the 1980s and '90s, including painting and screenwriting. 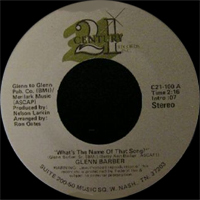 Glenn passed away on March 28, 2008. 1972 SP HICKORY 1653 (US) Who In The World / Yes Ma'am (I Found Her In A Honky Tonk) / ? 1977 SP GROOVY 102 (US) (You Better Be) One Hell Of A Woman / ? 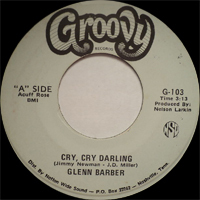 1977 SP GROOVY 103 (US) Cry, Cry Darling / ? 1978 SP CENTURY 21 100 (US) What's The Name Of That Song / ? 1979 SP CENTURY 21 101 (US) Love Songs Just For You / ? 1979 SP MMI 1029 (US) Everybody Wants To Disco / ? 1979 SP MMI 1031 (US) Woman's Touch / ?